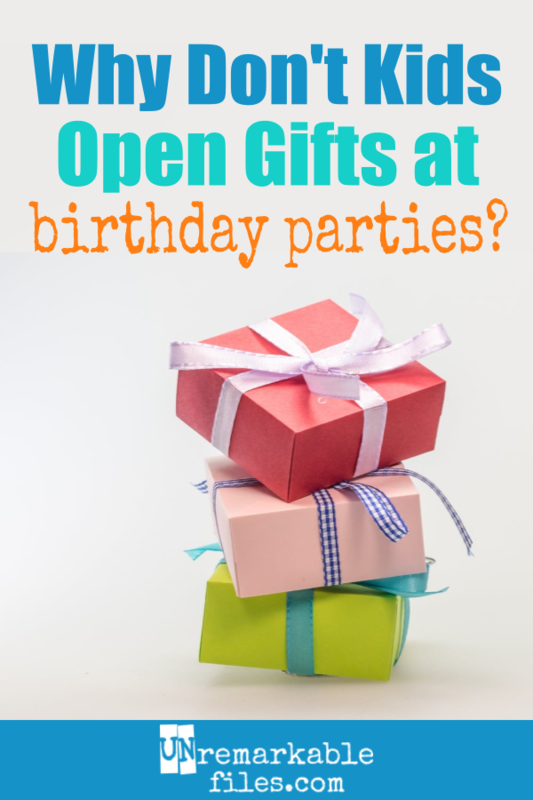 Unremarkable Files: Why Don't Kids Open Gifts at Birthday Parties Anymore? Why Don't Kids Open Gifts at Birthday Parties Anymore? The birthday parties my kids have attended lately have been different from the ones I had growing up. They don't open presents. Gifts go in a designated spot and sit there while the kids play some games, take their favor bags, and go home hopped up on cupcakes and ice cream. We can only assume that the birthday child secrets herself in a closet and goes through the stack after everyone else leaves. It seems a little weird to think of her going through a big stack of presents later on, without a single soul to say "thank you" to, as if they came from nobody at all. It's a missed opportunity to practice gratitude. It's also disappointing to everyone else! When my kids get invited to a party, they put a lot of time into choosing the right gift and sometimes spend an hour or more creating a ridiculously elaborate birthday card. When I ask, "Did Jack like his present?" and they shrug, "I dunno, he never opened it," it's a real let-down for them. They wanted to see him open their gift, and they wanted to drool over what he got from everyone else. They don't want a thank-you card written by Jack's mom two weeks later in the mailbox. I think I understand the logistical concerns. Unwrapping presents at a party is hard: you've got to corral the guests, make sure nothing gets broken, and there's often a crying episode for one reason or another. But I still argue for the return to the custom of opening presents at a kid's birthday party. Every kid needs to know how to look someone in the eye and express thanks, and in my experience, I've found that most kids need all the practice they can get. Kids don't enter the world knowing that it might be considered rude to, say, run screaming from the room because they unwrapped a birthday gift that contained socks. We laugh about it now, but what was an embarrassing situation then was also a good moment to teach that when you get a gift you're not crazy about, you find something to like about it and say thank you. Kids don't know these things unless they practice, and they have to practice over and over. I wonder if the disappearance of gift-opening at birthday parties is a sign that the art of gratitude is dying a slow and undecorated death. I've seen fill-in-the-blank thank you cards for kids touted in a parenting magazine that read something like: "Dear _______, Thank you for the ___________. It's awesome! Love, _______." Needless to say, I'm not a fan of the form letters. What I am a fan of is the joyful mayhem at birthday parties where gifts are opened in front of everyone. The kids are all so excited to give their present, jumping over and other yelling "Mine next! Mine next!" Take that away, and the gift becomes the equivalent of the cover charge to get into the party. If parents really and truly don't want to open gifts in front of everyone, I think the next best thing to do would be to request "no presents" on the invitations, or to pick their child's favorite charity and ask everyone to bring something to donate instead. I guess there are all different philosophies about birthday parties out there. Some parents would rather not open presents at the party and find other ways to teach their kids about gratitude instead. But I've got 5 children and no time, so you'd better believe I'm making the most of every party. If I'm throwing one anyway, I might as well toss in a lesson on manners while I'm at it. Maybe the parents don't want kids to compare their gifts to the others given? I don't know, I too prefer to have them opened at the party. It is not always convenient to open at the party. My sons have had and attended parties at venues away from home. As much as I enjoy watching a guest of honor open their presents, it is not always that simple. These parties are typically on a schedule, that is, maybe 2 hours of play followed by a short stint in a designated party room. This short stint would include lunch and/or birthday cake followed by eager parents ready to take their children home. As much as I would like to see the guest of honor open presents, there is usually only enough time for a warm and heart felt thank you. Flash forward - gifts are opened at home and it IS most appropriate to send an age appropriate thank you, both for the specific gift and for attending/helping celebrate the occasion. An age appropriate thank you - especially if gifts opened later - is most appreciated! The point is to teach gratitude, isn't it? On a separate note, not all guests are able to provide a gift, or are on a budget, especially if they're invited to multiple parties!). IMHO, it is not nice for guests to feel peer-pressure for having or not having given a comparable gift. So would I enjoy seeing the ferocious opening? Ya sure, but it's not that big a deal and no longer the rule. I suppose gift-opening doesn't fit in well with 2 other kids birthday party trends: inviting their entire class and everyone they know, and having it at a professional party venue where kids are shuttled from one activity to the next and out the door in exactly 90 minutes! Wait a minute - I realized I just described a wedding reception, and people don't open gifts there, either! I'd say it's about 50/50. It's so interesting how cultural differences dictate what is "polite" in these kinds of situations. Anyhow, we open gifts together. Usually because the kids have run out of things to keep them occupied. The gift opening is a double bonus: a time to say thank you and new things to play with right then and there. We have two (of the twenty-four) friend parties left. The gifts will be opened at them both. Being someone who has no kids, but has nieces that I adore and spend a lot of time picking out the perfect gift for, it breaks my heart that I don't get to see them open their gifts because the family gets invited to attend the kids party in order to get the celebrations over in one go. (The girls actually share a birthday, although they are 5 years apart, so it's one celebration for both girls each year). The thing is, what makes it worse is that the parents never mention the gifts after they've been opened, so no thank-you or information about whether the kids liked what they got. We've got the 4 year & 9 year party this weekend and I'm tempted not to take the presents and just hold onto them until we see them another time, but not sure if that would go down too well with the parents. I just figure the girls will get so many gifts, they won't notice if a couple are missing, then they'll get an extra surprise next time they see me and my partner. Hopefully I'm right (if I do go this way). How about having the child thank everyone at the door when they walk in, 1 simply for attending, and 2 for their generous gift, regardless of what it is. It seems like an extremely egotistical selfish thing to want gratitude from a child for a gift you picked out. What if someone else at the party couldn't afford such a nice present and now their whole day is ruined? Not to mention the time it takes up. I don't know what you and your kids are like, but my friends and I and our kids never slowed down, and were always totally bummed out when some overbearing shallow parent wanted us to put the party on hold to open presents and appease some adults looking for accolades for the present they bought at the expense of other people's feelings and the children's fun. We recently skipped the gift opening part at my daughter's party a year or two ago because the kids were having so much fun playing, and when their parents came to pick them up there was a collective sad sigh that they didn't get to see the presents get opened, so in my experience the kids have been the ones who've liked it. I agree that presents should be opened at the birthday party. I think that the charm and fun of gathering around the birthday child and seeing what awaits is part of the fun and tradition! I understand that maybe some people don't open presents because someone forgot a gift or another reason. However, what about considering the feelings of the kid that spent time picking out a special gift, creating a card, wrapping the gift and waiting in anticipation to see it opened by a friend? Aren't their feelings just as important as the other child's? I agree also, that this is an opportunity for the birthday child to be gracious and thankful.